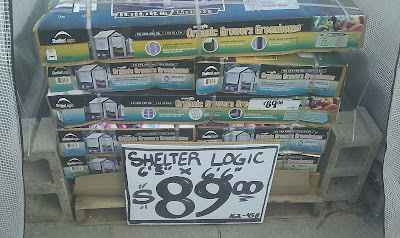 This portable greenhouse is available from Home Depot for $89 and has excellent reviews (it costs $200 from the manufacturer's website, ShelterLogic 6 ft. x 5 ft. Polyethylene Organic Growers Greenhouse). The store showroom unit had concrete blocks at the base ($1.49 each) to prevent from being blown away with strong winds. A indoor-approved heater may be needed during the winter (mostly at night). 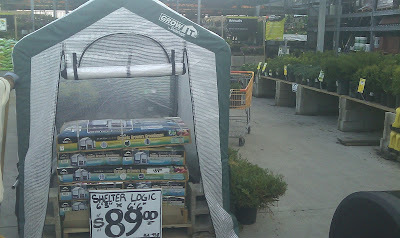 The greenhouse features a mesh fabric cover, steel frame, fasteners and 4 earth anchors. Adjustable vents on all sides permit ventilation. There are a zippered screens and side panels with screens to keep bugs out. The polyethylene fabric cover is designed to disperse sunlight for optimal plant growth.